Tart and sweet, a wonderful combination! This is my favorite recipe for making lemon curd. Very easy, fun to make and delicious. I also use the curd as a filling for pies and tartelettes. My advice is to use organic eggs and lemons for the most delicious and lemony result. But at least make sure your lemons are unwaxed. Put the lemon zest and juice, the sugar and the butter into a heatproof bowl. Sit the bowl over a pan of gently simmering water, making sure the water is not touching the bottom of the bowl. Stir the mixture every now and again until all of the butter has melted. Lightly whisk the eggs and stir them into the lemon mixture. Whisk until all of the ingredients are well combined, then leave to cook for 10-12 minutes, stirring every now and again, until the mixture is creamy and thick enough to coat the back of a spoon. You should reach a themperature of around 76 °C for the curd to get thick. Do not go too high or else your curd could curdle. Remove the lemon curd from the heat and set aside to cool, stirring occasionally as it cools. Once cooled, spoon the lemon curd into sterilized jars and seal. Store in the fridge. This looks delicious! How much curd does the recipe make? And you use the whole egg, yoke and white, correct? Yes, you use the whole egg. 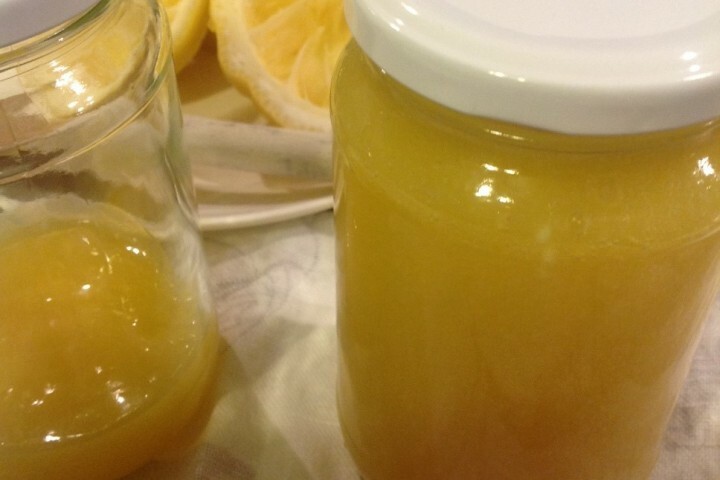 It does not yield that many jars, it also depends on the amount of juice. The weight will be around 1000 grams but about the volume we are not sure. Keep two 450 ml (to three just to make sure, depending on the size of your jars) jam jars ready, one will be filled completely, the other (two) very probably not. How many lemons do you need to use? Sorry for that. Somehow the number had fallen away, probably with a little update we did recently to make a ‘neater’ list of ingredients. It is 4 lemons!